Stock futures point higher on Thursday after spending much of the premarket session in negative territory, Tesla posts its largest-ever quarterly loss, Amazon to begin Whole Foods deliveries via Prime Now. U.S. stock futures turned higher on Thursday, Feb. 8, after spending much of the premarket session in negative territory, suggesting that investors weren't quite ready to return to equities following three days of intense volatility that has rocked global markets. Contracts tied to the Dow Jones Industrial Average rose 48 points on Thursday, while those linked to the broader S&P 500 gained 5.25 points. Nasdaq futures were up 29 points. As with previous sessions this week, the elevated levels of the Cboe's Volatility index, which closed at 27.19 on Wednesday, Feb. 7, could mean significant swings throughout the trading day. The Dow fell 19 points, or 0.08%, on Wednesday, the S&P 500 declined 0.50% and the Nasdaq slumped 0.89%. Treasury yields rose Wednesday on news that Senate leaders reached an agreement on a two-year budget deal that would prevent a government shutdown. But the spending package faces a bumpy road in the House. Bond yields continued to rise on Thursday, with U.S. 10-year Treasury bonds at 2.864%. The economic calendar in the U.S. on Thursday includes weekly Jobless Claims at 8:30 a.m. ET. Four Federal Reserve officials have speaking engagements on Thursday, including Philadelphia Federal Reserve Bank President Patrick Harker in New York, and Minneapolis Fed President Neel Kashkari in South Dakota. Twitter Inc. ( TWTR - Get Report) posted fourth-quarter adjusted earnings of 19 cents a share, 5 cents above estimates, and said active daily active users in the quarter rose 12% from a year earlier. The stock jumped nearly 20% in premarket trading on Thursday. CVS Health Corp. ( CVS - Get Report) was up 1.6% in in premarket trading on Thursday after fourth-quarter earnings and revenue beat analysts' expectations. Yum! Brands Inc. ( YUM - Get Report) said it earned 96 cents a share on an adjusted basis in the fourth quarter. Analysts expected adjusted profit of 80 cents. Shares gained 1.1%. Viacom Inc. ( VIAB - Get Report) earned an adjusted $1.03 a share in its fiscal first quarter, beating estimates of 93 cents. The stock fell 3.3% in premarket trading. T-Mobile US Inc. ( TMUS - Get Report) said fourth-quarter earnings came in above analysts' forecasts. The company received a $2.2 billion benefit from the new U.S. tax law. Earnings are also expected Thursday from Activision Blizzard Inc. ( ATVI - Get Report) and Nvidia Corp. ( NVDA - Get Report) . Activision Blizzard and Nvidia are holdings in Jim Cramer's Action Alerts PLUS Charitable Trust Portfolio. Want to be alerted before Cramer buys or sells the stocks? Learn more now. Tesla Inc. ( TSLA - Get Report) reported a quarterly loss of $3.04 a share on an adjusted basis, narrower than analysts' expectations. However, the GAAP loss in the fourth quarter was $675 million, or $4.01 a share, the largest loss the carmaker has ever posted as it struggles to overcome delays with production of the mass-market Model 3 sedan. Revenue in the quarter rose to $3.29 billion from $2.28 billion a year earlier. 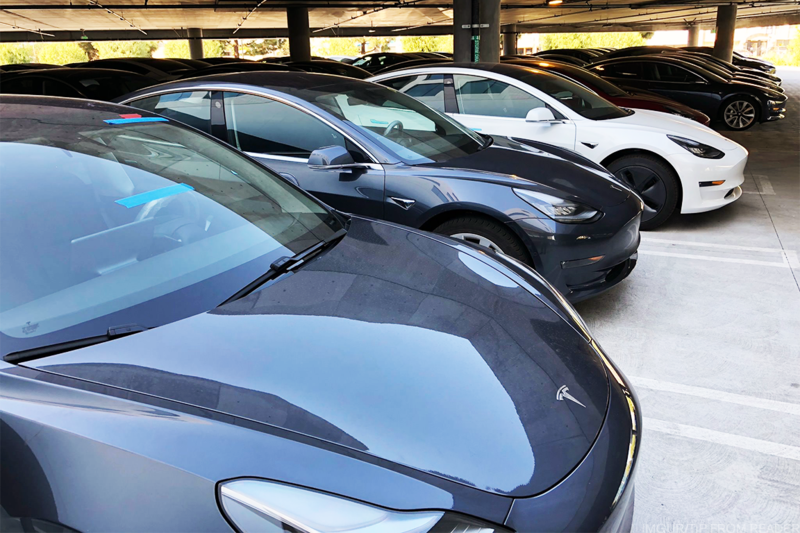 A couple weeks after Tesla responded to a CNBC report about ongoing Model 3 production challenges by reiterating its production targets for the relatively cheap sedan, the company did so again on Wednesday: It's still aiming for a 2,500-vehicle weekly production rate by the end of the first quarter, and a 5,000-vehicle rate by the end of the second quarter. Tesla had at one time wanted to get to 5,000 units per week by the end of the fourth quarter but gradually pushed back its goal in response to battery module production issues. Tesla said net reservations for the Model 3, which saw only 1,542 deliveries in the fourth quarter, "remained stable" as reports of delays mounted, and have grown in recent weeks as the car began appearing in select Tesla showrooms and garnered positive reviews. But no number was provided. Tesla shares fell 0.6% in premarket trading on Thursday. Amazon.com Inc. ( AMZN - Get Report) introduced free, two-hour delivery of groceries from Whole Foods Market through its fast-shipping Prime Now service, with plans to expand across the U.S. in 2018. Starting Thursday, Prime customers in Austin, Texas, as well as in Cincinnati, Dallas, and Virginia Beach, Va., can begin shopping from Whole Foods' selection at www.primenow.com or by using the Prime Now app. Amazon Prime members will receive two-hour delivery for free and one-hour delivery for $7.99 on orders of $35 or more, the company said. Stephenie Landry, the Amazon vice president who oversees Prime Now, said the online retailing giant plans to expand the effort, but declined to say how quickly, The Wall Street Journal reported. She noted that Prime Now grew to more than 50 global markets in less than three years following its creation. Amazon acquired Whole Foods last year for $13.7 billion. Twenty-First Century Fox Inc. (FOXA said adjusted profit of 42 cents a share in its fiscal second quarter topped analysts' forecasts, and revenue rose to $8.04 billion from $7.68 billion a year earlier. Revenue at Fox's cable TV division rose 10%. Fox reached a deal in December to sell significant assets to Walt Disney Co. (DIS - Get Report) , including the historic 20th Century Fox movie studio. It is keeping broadcast, sports and news assets, including the Fox TV network and Fox News. Fox's cable TV segment reported higher advertising, syndication fees and affiliate fees from cable and satellite providers, which boosted revenue to $4.4 billion. The stock rose 0.4% in premarket trading on Thursday. Jeff Immelt, the former chairman and CEO of General Electric Co., was named chairman of health-care technology company Athenahealth Inc. (ATHN . As chairman, Immelt may have to tangle with hedge fund Elliott Management, which acquired a 9% stake in Athenahealth and which has begun pushing for changes, saying the company's stock was undervalued. Athenahealth shares rose 2.2% in premarket trading. This article has been updated with earnings from Twitter, CVS Health, Viacom, T-Mobile US and Yum! Brands.